When you’re setting up a virtual machine on Linux using KVM/QEMU, you’ll more than likely need to setup a bridged network device. I’ve done this now a couple of times, and both times the network has “hung” during bootup. It seems that this is because I’m also enabling an MTU size of 9000 (Gigabit ethernet with jumbo frames) using the mtu stanza in the br0 section of /etc/network/interfaces. to the interface. This sets the mtu on the interface which br0 is bridging – in my case eth0, you’ll need to edit to suit your configuration. This will solve the long bootup problem, and cause jumbo frames to be enabled at the point the interface is brought up. When connecting to my iSCSI target on the SAN, this makes the transfers no end quicker. Posted on Sunday, November 17, 2013 Sunday, November 17, 2013 Categories GeneralLeave a comment on Linux network bridge devices. Posted on Wednesday, August 17, 2011 Categories GeneralLeave a comment on Gah, Damn, Sod It. 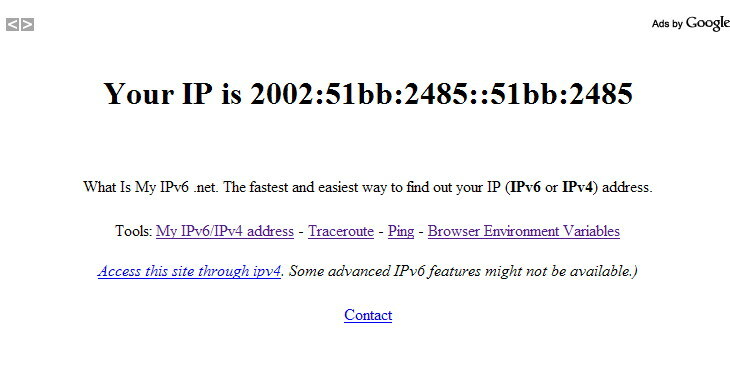 The link gives all information required to change where windows 7 looks to find out what the status of the currently connected network is. Posted on Wednesday, July 7, 2010 Categories GeneralLeave a comment on Spammer accounts deleted. ADSL2+ has been enabled on my phone line (last night, interrupting a chat with a friend on MSN, grrrrr) so I’m now looking at 13.5Mbit/S download and 1.8Mbit/S upload. For no extra cost, in fact it works out cheaper as my peak time allowance has been raised by a gigabyte. EDIT: The line has now stabilised at 21Mbit/S down. And I’d misread the “up” figure before. It’s actually 992Kbit/S. Posted on Wednesday, August 5, 2009 Wednesday, August 12, 2009 Categories GeneralLeave a comment on w00t! “Finally!” I hear you cry. I got bored of the plain old theme on the website. This one seems a little more interesting. We’ll see how long it takes me to get bored of it. Posted on Friday, November 7, 2008 Categories GeneralLeave a comment on “Finally!” I hear you cry. 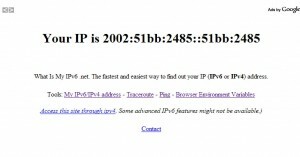 A new IP address. One of those newfangled big ones. Wahey! Why Yahoo! Answers is broken. The lunatics are in charge of the asylum, that’s why. Someone asked a question wanting to know which codec they needed to import a music file into their application – they were getting an error “unknown codec”. 1) A generic answer which would solve the problem for all people having this error, explaining what a codec was, and how to find out which codec would be needed for any file. 2) An answer that included the lucky guess “Ogg Vorbis”. Guess which answer was given the “Best Answer”? Number 2. Huh??? It’s not an isolated incident, either. There’s more examples of this kind of lunacy. That’s not to say that I don’t understand why the answer got rated higher, it afterall solved the questioners problem in a quick and easy manner. It just didn’t add anything to the value of the site; it’s meant to be a repository of questions and good answers. Hey Ho. Question Title: Should I use the uniprocessor HAL with a Quad Core (Q6600)? Question content: Is there an easy way to switch HALs? LOLZ, dude. K3wln3ss for has changing HALs. HAL FTW!!!11!! And the number of people wanting their homework done is utterly outstanding. I’ve seen a number of multiple choice questions up on there. How can that not be homework? Posted on Sunday, May 18, 2008 Categories General, RantTags yahoo! asylum lunaticsLeave a comment on Why Yahoo! Answers is broken. I need to get out more, really. Posted on Saturday, May 17, 2008 Categories GeneralLeave a comment on Alchemical unfortunateness. At 00:54 on Wednesday the 27th February, an earthquake measuring 5.2 on the Richter scale hit the UK, causing untold disruption and distress – Many were woken well before their Giro arrived. Several priceless collections of mementos from the Balearics and Spanish Costas were damaged. Thousands are confused and bewildered, trying to come to terms with the fact that something interesting has happened in the UK. One resident, Donna-Marie Dutton, a 17 year old mother-of-seven said: “It was such a shock, little Chantal-Nice Blonde came running into my bedroom crying. My youngest two, Tyler-Morgan and Megan-Storm slept through it. I was still shaking when I was watching Jeremy Kyle the next morning.” Apparently though, begging, thieving, and grovelling has carried on as normal. The British Red Cross have so far managed to import 4000 crates of Sunny Delight, to help the stricken masses. Rescue workers are still searching through the rubble and have found large quantities of personal belongings including benefit books and jewellery from Elizabeth Duke at Argos. £2 buys chips, scraps and blue pop for a family of four. £10 can take a family to Stockport for the day, where children can play on an unspoiled canal bank among the national collection of stinging nettles. 22p buys a Biro for filling in a spurious compensation claim. At about 12:55am this morning, I was rudely awakened by a massive shaking of the house. Itonly went on for less than 30 seconds, but was quite scary. The top floor (I have a loft conversion where I sleep) was moving a good inch or so, probably because the transmission through the house is bound to shake a third floor more than the ground floor. Anyway, I’ve had a look round, and it appears that there’s no damage been done, which is a bit of a relief. Posted on Wednesday, February 27, 2008 Categories GeneralTags earthquakeLeave a comment on Earthquake!